There is no one more attuned to the sweep of America’s recent history in the Middle East than Zalmay Khalilzad, the former U.S. Ambassador to the United Nations, Afghanistan and Iraq during the George W. Bush Administration. he began his service in 2001 as US Special Envoy to Afghanistan, followed by ambassadorships in Afghanistan, then Iraq and, lastly, the UN. He now serves as President of Gryphon Partners and is on the boards of National Endowment for Democracy, America Abroad Media, the RAND Corporation’s Middle East Studies Center, the American University of Iraq, and the American University of Afghanistan. 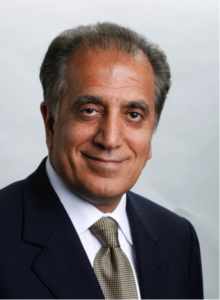 Ambassador Khalilzad is also a counselor at the Center for Strategic and International Studies. Personally signed copies of his book The Envoy: From Kabul to the White House will be for sale following the discussion.